The Grassroots Trust New Zealand Cycle Classic has long held the reputation of unearthing new talent or helping up-and-coming riders step onto a bigger platform … and today was no exception. Eighteen year old Australian rider Jensen Plowright, riding for Drapac Cannondale Development Team, won the 152km stage in a perfectly timed sprint finish from EVO Pro’s Aaron Gate in 3hr 42min 32secs. GPM Stultz’s Cameron Ivory was third, with Swiss rider and stage two winner Stefan Bissegger fourth. Defending champion and local hero Hayden McCormick (Team Bridgelane) was sixth while Ethan Batt was the first New Zealand National Rider over the line in 14th place. 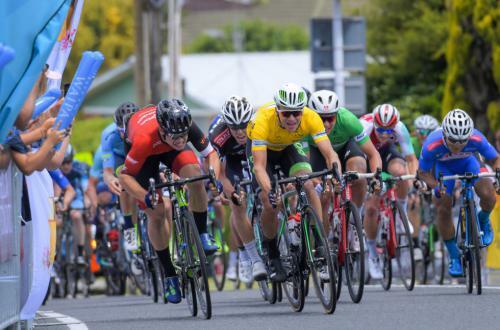 Plowright, who is a top junior track rider, managed to hold his line in front of the peleton as weaved into the Waipa township of Te Awamutu this afternoon just narrowly beating Gate, who retained his Grassroots Trust Yellow Jersey on general classification. Plowright thanked his team afterwards for putting him the best possible position after a gruelling day completing the hilly stage nick-named Te ara roa: the long road. Melbourne based Drapac manager Agostino Giramondo was thrilled for his young charges saying they’d come to New Zealand with the aim of making the podium. Whilst today’s stage ended in a bunch sprint finish, much of the action occurred early on with two breakaway groups providing most of the excitement. The first happened at 20km when six riders from Drapac, the Swiss National Team, New Zealand, Pro Racing Sunshine Coast, Team Rauland and GD Pringle formed a breakaway and maintained their position until around 75km when they were caught by the peleton. The second breakaway happened a short time later with Bissegger joining Team Skoda-Fruzio’s Reece Tucknott out in front and together, the pair extended their lead to 3min 20secs. They were later rewarded for their huge effort with Bissegger retaining both his Foster Construction U23 Jersey and the BNZ Sprint jersey while Tucknott, a top Australian mountainbiker, was presented with the Winger Suzuki Most Aggressive Rider Jersey. With 20km to go the peleton, driven largely by EVO Pro, clawed back the leaders’ advantage. Bissegger eventually sat up leaving Tucknott out in front alone until he was swallowed by the peleton with 10km to go. Then it was all on with the New Zealand National team, EVO Pro, St George, the Swiss National team and Drapac rallying the troops as the bunch hurtled towards the finish line. On the podium, Gate thanked all his team mates for keeping him in the yellow jersey but made a special mention to Cryus Monk for his huge effort in doing time checks on the breakaway groups. Gate said his team would nnow focus on tomorrow’s gruelling 143km Queen Stage which finishes on top of Maungakawa Hill. “It’s a formidable climb that one and I tend to avoid it in training even though it’s only 5km from my house,” said Gate who is originally from Auckland, but now lives in Cambridge. Swiss rider Cyrille Thiery backed up his stunning day yesterday by keeping the Three Peaks Manuka Honey King of the Mountain Jersey. But along with team mate Bissegger he remained closed-lipped on his team’s plans for Stage 4. “We will see what these track riders can do on a hill climb,” joked Theiry to an appreciate crowd at the finish line. Race director Jorge Sandoval said it was exciting to see more young talent shine during the Tour. “We’ve had the likes of Julian Dean, Chris Jenner, Robbie McEwen and Hayden Roulston all claim the yellow jersey while many others have gone on to ride in the Tour de France. For me that is very rewarding,” he said.